We may not have noticed it yet, but pigs are slowly taking over the planet! There are an estimated two billion of them on Earth, living on every continent except Antarctica. We humans are partly to blame – pigs have been a part of our lives for thousands of years. With this film, we follow the many lives of pigs and ask, what is the key to their remarkable success? When we think of pigs, we often think of food – that is how we have looked upon them for hundreds of years. So it seems we have a contradictory love-hate relationship with pigs. But if we look at their natural history and their behaviour, we can just appreciate them for what they truly are – incredibly intelligent and successful animals with a nose for survival wherever they live. Pigs aren’t afraid of frostbite – in Siberia, where winter temperatures plummet to minus 50 degrees Celsius, they have shrugged off the extreme cold by growing thick woolly coats. In contrast, some pigs like it hot: a group of domesticated pigs have gone wild, forming a social group living together on a small desert island in the Bahamas, where they have set up a republic with a thriving beach party atmosphere. 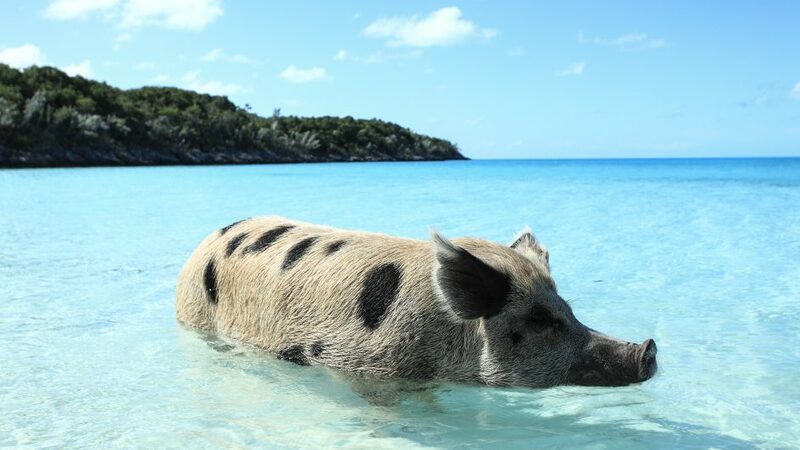 These Caribbean pigs have become a sensation – attracting boatloads of tourists who visit in the hope of swimming with the pigs. What’s remarkable about the Bahamas pigs is that they enable us to get up close to a pig society that has newly formed. Social structure is key to their survival, but another important key is their taste in food – pigs will eat almost anything. In this respect, they are just like humans, able to adapt to whatever situation by being generalists, not specialists. Spread across Europe and Asia, the wild boar is one of the most common of the pig species, and the parent of all farm pigs today. Their ability to vary their diet according to conditions and availability of the different items, along with human interaction has seen them gain one of the widest geographic distributions of all terrestrial mammals. This program will feature stunning 4K natural history footage to show pigs in their natural environment, where they often act as important ecosystem engineers. Punctuated with personal human stories and the latest findings from pigs in captivity, this film will highlight the vital role pigs play in human culture, as well as in the wild across the globe.